One sip of the fire in the water and he began telling of a friend of his, new to visionary experience, who'd recently sought council from a Brazilian shaman. The friend had been traumatized, during a lengthy initiation rite, when he had a vision of a bunch of fearsome, remorseless Reptile Beings, The Reptile Men surrounded John's terrified friend, informed him that they controlled the entire world, and prophesied that they were going to devour the whole thing. In response to this revelation, the old shaman waved his hand dismissively and chuckled, "Those Lizard People! They think they run everything!" 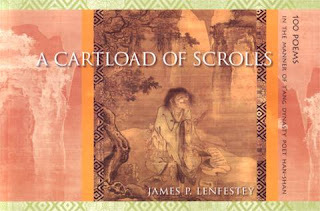 Poet James Lenfestey will leave his hermit cave to come read to us on Friday, May 30, at 7 PM from his new book A Cartload of Scrolls - 100 Poems in the Manner of T'ang Dynasty Poet Han Shan. I write a Chinese-sized poem. unroll around me in plumes of paper mill steam. where paper was invented, poetry before that. There my verses will turn into faces. The people will nod with gentility and respect. So three poets enter a bar. The first gets drunk and raves. The second seethes jealously in the corner booth. ash floating in the air like dark feathers. I have been reading some literary blogs, but I am sure that there are many others I have not yet discovered. Please send along your recommendations for literary, poetry and bookstore blogs, and I will add them to the list here, or you can add them as a comment .